John Watkins, CEO of ENLASO and David Filip (#OASIS XLIFF Technical Committee and co-chair of the World Wide Web Consortium (W3C) MultilingualWeb-LT Working Group) will guide through the day. Kevin O’Donnell from Microsoft will talk about »Supporting XLIFF in Microsoft Products«. After this Phil Ritchie from Vistatec will talk about Okapi Ocelot, Okapi‘s new editor. The morning will close with a session by Yves Savourel from ENLASO. Yves’ topic is the »Practical Uses of ITS 2.0«. After a lunch break David Filip (LRC/CNGL, University of Limerick) will talk about »Interoperability Through Open Standards«. Right after this Patricia Bown and Lexie Sabota from Kilgray Translation Technologies will talk about »Standards: Liberation, not Limitation«. The day will close with the talk »At the End of the Day – A Reality Check« by Stefan Gentz from tracom.de discussing localization standards, where we stand today and which homework has to be done. 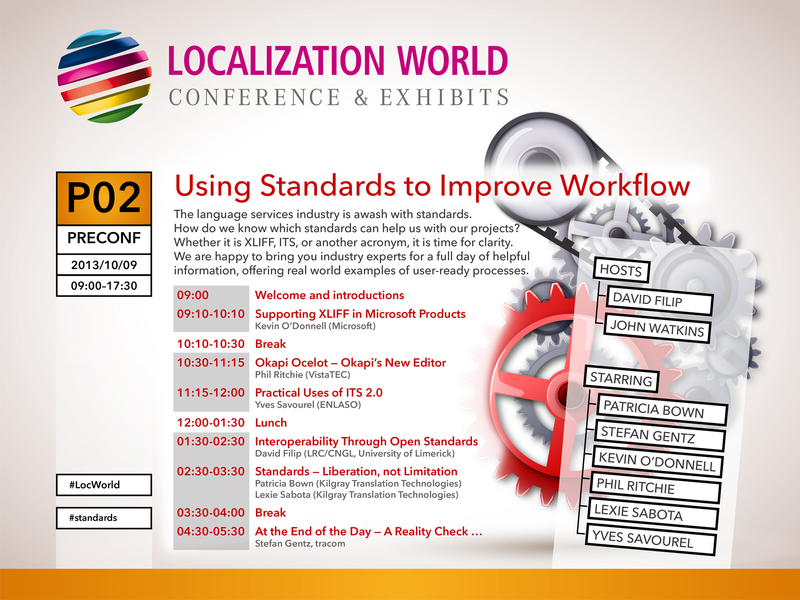 You can find the full programm of the Localization Standards Day at localizationworld.com. In a nutshell: Don’t wait. Register now. Join this highly-informative event which is sure to raise a lot of hot discussions throughout the conference! Dieser Beitrag wurde von Stefan Gentz am 12.09.2013 erstellt und unter Conferences abgelegt. Trackbacks sind geschlossen, aber Sie können einen Kommentar erstellen. Sie können diesen Beitrag auch per E-Mail weiterempfehlen oder Ihren Bookmarking- und Sharingdiensten hinzufügen.